In the lead-up to World COPD Day, November 21, 2018, Kemptville District Hospital (KDH) and the Lanark Renfrew Lung Health Program are delighted to announce that they have partnered to provide a new cardiopulmonary rehabilitation (‘rehab’) program at KDH. Designed for people with Chronic Obstructive Pulmonary Disease (COPD) and heart disease, the new cardiopulmonary rehab program has three elements: exercise, education, and support. Patients in the program will benefit from nursing, respiratory, and physiotherapy services. The program’s goal is to decrease the patient’s symptoms and increase her or his ability to function in daily life. The pulmonary (lung) component of the program began in September, 2018; the cardio (heart) component will start in January, 2019. The University of Ottawa Heart Institute is also supporting this initiative by coordinating the exercise component of the program, providing exercise sessions that local patients can attend via the Ontario Telemedicine Network (OTN), which uses two-way videoconferencing to provide access to care in hospitals and other healthcare locations across the province. 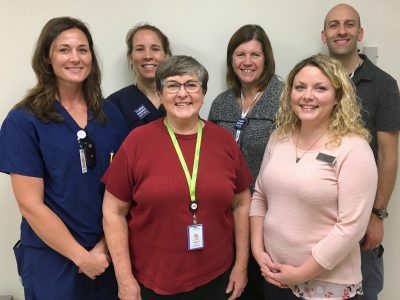 Each participant in the new cardiopulmonary rehabilitation program attends sessions at KDH twice a week for eight weeks; the program is offered in KDH’s new Clinic wing, opened in the fall of 2017. An important facet of the program is that it includes after-care: the program team will follow up with each patient three months after the program, and once again after six months. “The new program not only increases access to services for local people with COPD and heart disease, but it also provides improved monitoring of their conditions,” Burke added. She explained that COPD describes two conditions: emphysema and chronic bronchitis. People who have COPD may experience shortness of breath, cough, phlegm and wheezing. Although a smoking history is one of the main causes of COPD, other causes may include longstanding asthma, air pollution, workplace or secondhand smoke exposures, and genetic factors. Both KDH and the Lanark Renfrew Lung Health Program acknowledged the Champlain Local Health Integration Network (LHIN) for providing community based funding and support for COPD programs and services. The public are invited to attend the Grand Opening of the new cardiopulmonary rehab program on World COPD Day, Wednesday, November 21, 2018, from noon to 1 pm in KDH’s Courtyard Lounge. Light refreshments will be served. People interested in participating in the program can call Christina Dolgowicz at 613.259.2182. Kemptville District Hospital is Accredited with Exemplary Standing, the highest ranking bestowed by Accreditation Canada. Committed to building healthier communities, we are a model of hospital-led integrated health services within the provincial health system. Kemptville District Hospital consistently ranks among the top hospitals in Ontario for both patient and employee satisfaction. We pride ourselves on being a good partner within the system. Kemptville District Hospital provides primary care management services, acute care hospital services, and advanced orthopedic care.